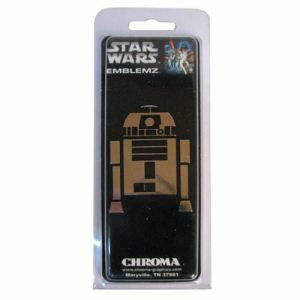 We have Just Sold out of Star Wars R2-D2 Chrome Injection-Molded Emblem. Not to Worry! Fill in the Notify me When Available and you will be the first in line for our restock of Star Wars R2-D2 Chrome Injection-Molded Emblem !! From the Star Wars collection by Chroma Graphics. Star Wars R2-D2 Chrome Injection-Molded Emblem. This item features 3M Adhesive backing. Chroma Graphics Star Wars Automotive shipping from Canada. No Surprise Border fees or Customs!